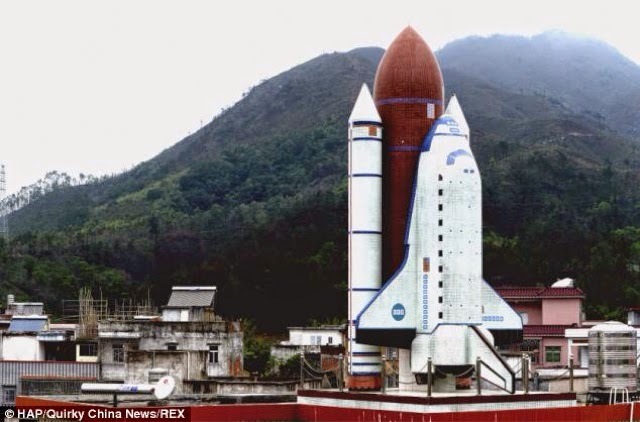 Farmer builds space shuttle and rocket on his roof! About two years ago I posted a couple of interesting pictures of a 'missile' on a roof top I saw at Wired Aperture. It was actually a dismantled fighter plane oil tank that a man in Yantai (China) turned into a solar water heater for his home. The man's wife said her husband found the tank in a pile of iron scrap at a local recycling station. 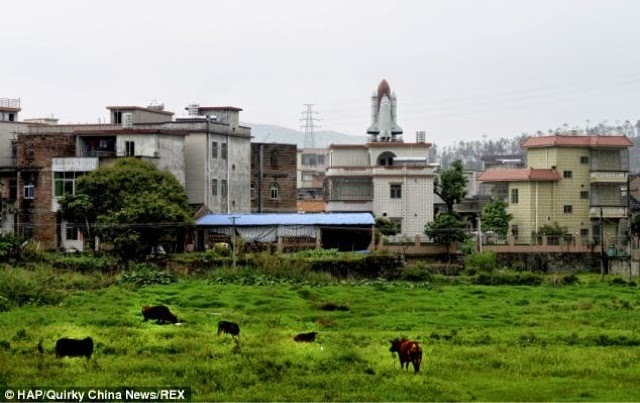 This time, also in China, a farmer build a giant 'space shuttle and rocket' on his roof top. Huang Yuzhan spent more than a year building the 7m high rocket and 3.8m high shuttle. He had always dreamed about building his own space shuttle ever since being a child. But while most people would give up such an ambition as impractical, this Chinese farmer could just not let the dream go. 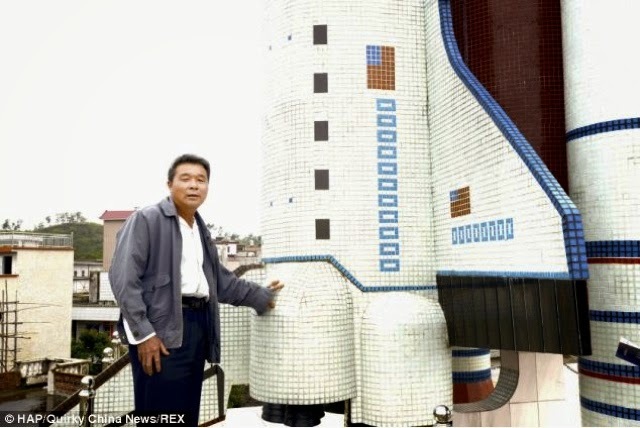 Mr Yuzhan spent more than a year building the 7m high rocket and 3.8m high shuttle at his home in Xiapu village, in southern China's Guangdong Province. The rocket, complete with two boosters on either side, is now a prominent feature of the Xiapu skyline, rising high above the surrounding buildings. The impressive structure, which appears to be made of ceramic tile, sits proudly on the top of the farmer's house. Earlier this week, Daily Mail reported on former Chinese military man Jian Lin, who built a fully functioning replica of the People's Liberation Army's Type 63A light tank, featuring a cannon that actually fires. You can read further about this and see more pics at The Daily Mail. TheGreenMechanics: That's one pretty cool hobby and imagination put into reality.